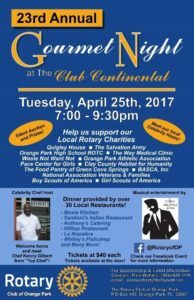 On April 25, 2017, The Rotary Club of Orange Park will be holding it’s Annual “Gourmet Night” event. Starting at 7:00 pm and located on the banks of the St Johns River at The Club Continental in Orange Park, you will be part of an evening of friendship and fellowship wrapped up with great food donated by over 30 local Restaurants. The event is an opportunity to support non-profit organizations in our local area.